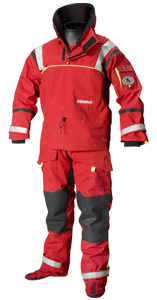 The two-piece Ursuit® Gemino Operative keeps you dry and on the water under all conditions, no matter whether your passion is fishing, boating, sailing or paddling. Seam structure: patented seam structure, that is based on the Flat Seam-technology this avoids multiple layers. Braces in trousers. Waist band. Includes separate neoprene hood and gloves. In upper part of trousers pocket for phone. Includes carrying / storage bag. Sleeve pocket with velcro tape and water exhaustion hole. Colour fluorescent yellow.